QI Talk Forum | View topic - Questions left unanswered by the show. Questions left unanswered by the show. Occasionally the guest's questions (usually directed at the QI master) are left unanswered. I believe answers should be posted here. On 30.09.05 it was asked if all stars are spherical. Perhaps all concerned would like to know that no star is perfectly spherical but all black holes are. (The statement was once made ''A black hole has no hairs'' which some French say confirmed the suspicion that the phrase for a collapsed star had some sexual conotations). Are stars not spherical because they rotate? However surely this particular question (as Stephen's testy rejoinder implies) is unanswerable? We cannot say for certain what shape ALL the stars in the universe are. They're defined by their mathematics to be perfectly spherical, I think. Although they do occupy a strangely-shaped piece if spacetime, so I'm not sure 'sphere' would mean what we're used to it meaning. They never will be observed, either - their name rather gives that particular feature away: no light can ever leave one. You know if you're looking at one, though - no stars will be visible in your line of sight with even the most powerful telescpe. Utter, utter blackness. There are lots of gravitational lens phenomena that are very well accounted for by black holes, and their existence is predicted by all the same sets of models that work so completely perfectly for Einstein, NASA and all the radio emissions given out by pretty much every galaxy in the sky. In this respect, they're a lot less theoretical than, say, quarks. I'm sure I read something in one of Stephen Hawking's books saying ''A black hole ain't so black''. (Anti-matter is sucked in out of matter/antimatter pairs, leaving light particles to emit from around it. Such matter/antimatter pairs occur all the time, so I'm led to believe, but annihilate each other). A black hole of the Sun's mass would therefore have a radius of only two miles. Gray, what causes the Sun's rotation to be of an entertaining fasion? Does a similar rotation take place on the Earth, or on gas planets? I rather thought that would be the likeliest answer. Same for black holes. But young Gilmore here seems to be telling us that stars are NOT spherical. May we have a reference or some corroboration, please, Rory – as is our habit on these boards? That radiation that black holes are supposed to chuck out - modestly called 'Hawking radiation' should indeed exist. Pairs of particles/anti-particles are popping out of nothingness all the time, hanging around for a couple of zeptoseconds, then annihilating one another. If this happens on the edge of a black hole's event horizon, one half of this particle pair will be sucked in, and the other will zoom off into space, which we may detect. That's not really seeing the hole - just the evidence that it's there (like the lensing effects). The Sun rotates entertainingly because each bit of it rotates around the pole at a different rate - fastest at the equator. It gradually wraps itself up (with all its magnetic field lines) until it 'can take no more', and these magnetic fields straighten themselves out, giving off enormous solar flares. Jupiter does indeed do the same thing, although non-gaseous planets like our obviously can't. It's known as 'differential rotation', an effect first noticed by Giovanni Cassini in 1690. The interaction of these gasses moving at different speeds is what gives Jupiter and Saturn their chaotic swirling bands, and Jupiter's red spot. Flash, minimun energy would account for the spherical shape of celestial bodies, from planets to stars. But because they're all rotating, these shapes generally spin out slightly flatter than perfect spheroids. Depending on how they've been formed (and what kinds of collisions they've had in the past) planets and moons have varying densities (called 'mascons' - short for mass concentrations) that also tend to alter their shape. 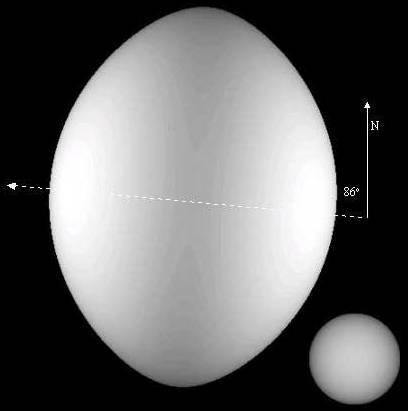 Regulus is the brightest star in the constellation Leo, and it is egg-shaped. A group of astronomers, led by Hal McAlister, director of Georgia State University's Center for High Angular Resolution Astronomy, have used the center's array of telescopes to detect for the first time Regulus' rotationally induced distortions. Scientists have measured the size and shape of the star, the temperature difference between its polar and equatorial regions, and the orientation of its spin axis. Regulus' centrifugal force causes it to expand so that its equatorial diameter is one-third larger than its polar diameter. In fact, if Regulus were rotating about 10 percent faster, its outward centrifugal force would exceed the inward pull of gravity and the star would fly apart, says McAlister, CHARA's director and Regents Professor of Astronomy at Georgia State. Fantastic. We should use that somehow, for sure. Wow - that is amazing. Considering nearly all stars (apart form ours and a few other close ones) until very recently could only be seen as 'point sources' of light, you can see how good telescopes are getting. Imagine two cars colliding head on - they just crumple into each other. Now imagine those two cars hitting straight on, but off-centre - driver's headlight to driver's headlight. The resulting mass of metal will be spinning around because the centres of mass were not on the same line. This works for whirlpools, planets, solar systems and galaxies as well. Jupiter also bulges noticeably at the equator due to the speed at which it rotates, as can be seen through even a small telescope. In some cases, you can find a red giant star in a binary system with a white dwarf. Here the material in the red giant will expand until it reaches the "Roche limit" which defines when the material is no longer held within the gravitational field of the red giant but instead is more strongly attracted to the companion white dwarf. This is all quite interesting. We can all agree then, that not every star in the universe is spherical as they bulge at the equator and the surface is not completely smooth for any length of time?